FACEBOOK…a Business Method Patent for the Masses. Some believed that the Supreme Court was going to invalidate the lot, but business method patents remain, and today’s Patent of the Day is an interesting read for any FACEBOOK user. U.S. Patent no. 7,669,123 was issued just last year on (my birthday, no less) February 23. Issued February 23, 2010, Assigned to Facebook, Inc. Given the easy familiarity of the subject matter, this patent can serve as a nice tool for enhancing understanding of just how one might define or explain a business method, and how one might construct claims to specify a hopefully enforceable subject matter. That is not to say that I have undertaken a validity analysis of this patent; I have not. Nonetheless, the opportunity for an average reader to follow along, with his or her own routinely performed actions described, along with the technological support for the handling of the data related to those actions, exists in this patent. The entire patent text can be found at www.innovative-ip.net, on the “of interest” tab. I encourage you to take a look. If you find it interesting, you can even link to it or share it on your FACEBOOK page. I like the concept of the “layers” involved in participating in the business method of the patent that is actually the topic. In fact, I like it so much that I’m going to link over to the innovativeip FACEBOOK page right now. Hope you Enjoy! This entry was posted on February 23, 2011 at 5:33 am	and is filed under Uncategorized. 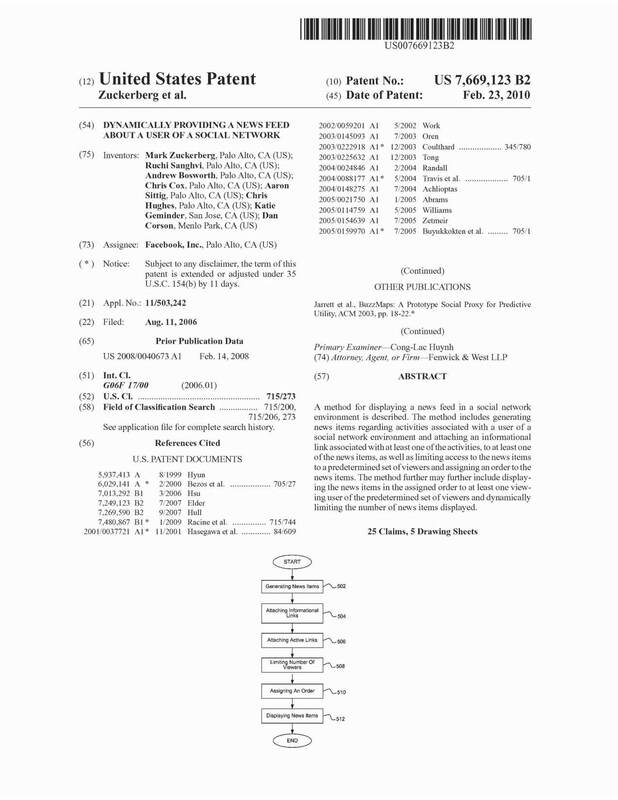 Tagged: business method patent, FACEBOOK, innovative ip, patent, patent of the day. You can follow any responses to this entry through the RSS 2.0 feed. You can leave a response, or trackback from your own site.